You’ve got content on your site that doesn’t intentionally target any keyword. But how do you identify those opportunities and, most importantly, capitalize on them? In today’s Whiteboard Friday, Rand illustrates the process of creating your own content-to-keyword map to discover where to optimize, what content to build, and how to intelligently target keywords when you’re auditing a site. Howdy, Moz fans, and welcome to another edition of Whiteboard Friday. 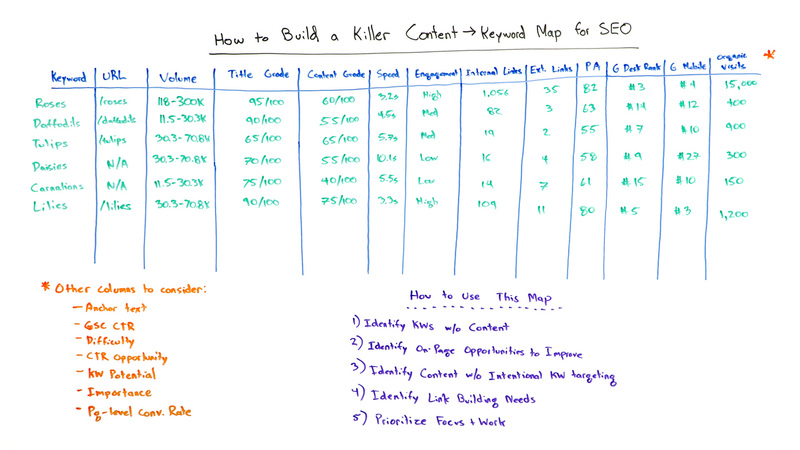 This week we’re going to chat about building a killer content-to-keyword map. Now this is something that pretty much every SEO does when they do an audit of a site, whether that’s in-house or as a contractor or an agency consultant. What we’re trying to get here is a picture of: Here are all the keywords that we’re trying to target. Here’s all the content that we have, and maybe we have keywords for all of that content. Maybe some of that content doesn’t have a keyword, those kinds of things. We’re trying to map these together so that we know what needs optimization, what new content needs to be built, what keywords need to be targeted to fit with which content, all of these types of things. This is how we identify the priorities and work that an SEO should be doing as they’re attacking a new site, attacking a new campaign. Usually this is done in Excel or it’s done in Google Spreadsheets. Either one can work fine. Unfortunately, there’s no great software to do this right now. You could use a tool like Moz or a tool, if you’re on the enterprise side, like Searchmetrics or Conductor to get a lot of this data. You may pull the data from tons of different places, a Screaming Frog here or a Stat over there, whatever it is, OnPage.org. But what you’re trying to build here is essentially all my keywords mapped to all my URLs. Sometimes you might . . . in fact, if you’re doing a comprehensive job, you should find places where you don’t have a URL for some keywords because some keywords haven’t been targeted yet, but you still want to rank for them. You should probably have some URLs for which you have no keyword. Essentially you haven’t intentionally targeted a keyword with that page yet, and this might actually help you prioritize and try and do some of that. Then you have things like: How much search volume does this get? You’re going to try and estimate or use a tool to give you a grade around the title, the content, maybe the URL itself, load speed, and engagement. Engagement could be browse rate or time on site or pages per visit or some combination of all of those things. I might look at something like a page authority to try and roll those up, Google Desktop and Google Mobile rankings, and the organic visits that that page has received from search engines. Anchor text if you want to analyze your internal and external anchor text. 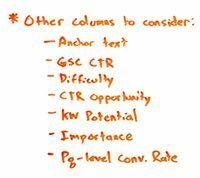 Google Search Console click-through rates for some of the keywords here and add that data in. We all know Google Search Console, not phenomenal data, but sometimes can be useful. Importance Score, your custom Importance Score, your Potential. You might order these differently based on those kinds of things. Page level conversion rate. How much does this contribute to content that converts on my site? How well does it convert directly? Those types of things. Identify keywords that have no content mapped to them. Essentially that’s saying, “Hey, I better build some content if I want to target this keyword.” That’s work that you need to do. Or for example, you might say, “Huh, I’m doing pretty well on a bunch of these metrics, but boy, that page load speed is really bad. Look, I can see that in the desktop versus mobile ranking. I’m ranking a lot better on desktop than I am on mobile. Maybe that load speed is one of the reasons why.” I could look at other on-page improvements like, “Ooh, man, that low engagement. I bet that low engagement is dragging down my potential for rankings.” All right, those two. Identify content without intentional keyword targeting. So I might find in here that I have something like /flowers, which offers all of my different flower options here, but I have not intentionally chosen what I’m targeting. Am I selling flowers for delivery? Should I be targeting that? Am I selling flowers for greenhouses or for planting in your backyard? Should I be targeting that? What is my keyword here? Shoot, I have not built one in yet. Oftentimes, when you’re auditing a site, you will find tons of URLs that are intentionally targeting no specific keyword but should be. All you need to do is some optimization work to help those URLs target the keywords that they should. Identify link building needs. So I might look in here and I might say, “Huh, my external links, ooh, that’s pretty bad, and my rankings kind of reflect that. I need to do some link building. Like, that page is not going to rank. Even though it’s doing all right on on-page, it’s not going to rank without this. Prioritize and focus your work so that you can do the most important things after you do this audit and you can really move the needle with your SEO. All right, everyone, take care. We’ll see you again next week for another edition of Whiteboard Friday.